The Queen should’ve just looked into her mirror—and stopped listening to her mirror—to see that she is indeed fairer than Snow White. I mean, judging 76-year-old cartoon characters on the basis of hotness is kinda creepy, but I’ll risk creep accusations. The Queen is a babe. Too bad she’s a murderous psycho who’s obsessed with winning a beauty contest. It’s like she’s trying to one-up her mirror. “I’ll show you who’s more subjectively beautiful, you glass devil!” We’re all a little vain sometimes, but don’t you have a kingdom to run, lady? Not that the dwarfs are above reproach either. They’re sitting on a fortune in gems and they aren’t even spending any of it to improve their lot in life…or the lot of those less fortunate than them. Plus, they tend to wallow in filth. Geez, what a motley cast of characters. 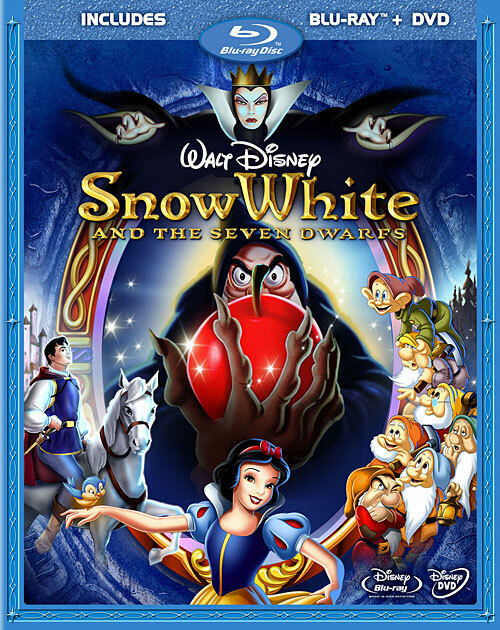 Snow White is one of the shallowest movie characters in history, but she should have just bailed on ALL these weirdos. Take the hardworking woodland creatures and split for Oz or Neverland or Belize. But I do love this movie. Irrationally, really. It’s the dwarfs! Dopey is the cutest nitwit of all time and Grumpy is pretty much always right. Snow White DOES bring them misery and they would’ve been saved a lot of heartache if they’d just kicked her out. Still, it’s sweet that even Grumpy relents. How can you not relent and fall for this gorgeous little trifle of a movie? The American Film Institute sure did, putting Snow & The 7 on five of its Best Of compilations, including both of the “100 Years, 100 Movies” lists. So, yes, the Queen is evil and everyone else in this movie is absurdly pure at heart, but I still think I’d like to live under the Queen’s reign. Apparently she spends most of her time gossiping with a mirror and not, you know, doing her job. You could get away with murder, maybe even step-daughtericide! The Queen herself almost does.